Thought I would share a few pics. I guess I need to find a way to embed photos into this topic. Sorry for the link instead. Neat obscure set. Here are a few of mine. Some cards have white backs, while others have silver/metallic backs. Not sure if all cards have both backs. There may exist prize cards (reverse imprint) for the set, but I haven't seen any yet. There is also a poster for the stickers to be attached to. My Muhammad Ali/Bobby Chacon card pair has ghost images from other cards! Last edited by sthoemke; 06-13-2018 at 01:11 AM. Interesting. I picked up an Ali as a type card a while ago. As I understand it they are Spanish? I could use a Chacon if you have a spare. Last edited by Exhibitman; 06-14-2018 at 12:00 PM. Yes. Made in Spain for the Venezuela market. Interesting how the Ali I have is perforated on the left, while yours is perforated on the right. Looks like there was more than one configuration of these cards. Last edited by Exhibitman; 06-20-2018 at 10:45 AM. Anyone Seen Any Graded Versions? 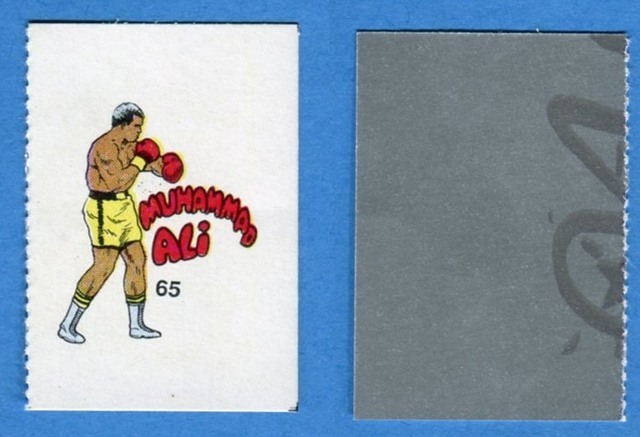 These are really cool boxing stickers and so I was wondering if anyone has ever seen a graded on from PSA or SGC or Beckett? AND, is anyone trying to get a set together? I have seen images of the collector sheet used for these but have never seen anyone who actually has a full set of the boxers. I know these were also seeded with unique and rare cartoon characters on some. Meaning, one panel of the two panels connected by perforation has a boxer and the other panel is a cartoon scene or character from Spain. Anyone seen any of those? Wonder if that was on purpose or was an error? I acquired one of these rare original collector sheets while in Spain. Need Numbers for a set? I have extras if someone is making a set. Let me know and we can work something out. If you collected all the 72 boxers on the sheet and showed the retailer, you would get a *prize*. Retailers would either then take the sheet or mark it redeemed. Very few ever were completed. The back has 72 boxes of the cartoon characters and you could fill that side AND the boxing side and win a BIGGER *prize*! Last edited by VintageLover; 01-29-2019 at 10:04 AM. Ali also shares a card pair with #64 Bob Foster on the left. In addition to the white backs, there are also foil backed cards, many of which have ghost images of other printed products(?). Therefore, there could be up to 4 versions of each card. I believe the "shadow" objects on some are printing flaws since some other stickers I have seen have the color offset by 5% or more. Cross contamination of the sheets was easier since the ink used was a very thin watercolor type ink. Not thick like used on other Panini type stickers. Just from what I know about printing. I've been doing some research and chatting with friends in Spain and they said that these became "discovered" when a company called Therp Sajik Enterprises was running ads in local papers asking to buy stickers and non-sport cards back in the mid to late 1990's. She said they still buy every few years in Spain and Portugal but so many kids kept the cartoons and pitched the boxers. Adults would often see the boxers and would snag some but mainly periodical shops had these in packs. Last edited by VintageLover; 02-01-2019 at 12:37 PM. They're not the most impressive things but they do have card of Olivares and Chacon, who otherwise don't have any career issued cards I can find.